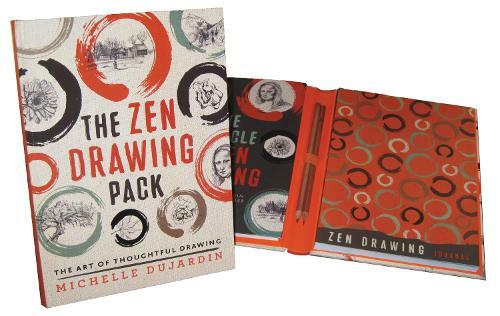 Awaken your inner artist and find peace with The Zen Drawing Pack. Add soul to your sketches by ignoring conventional drawing techniques and focus on really seeing your subject. Artist Michelle Dujardin will help you achieve a meditative state just by changing the way you see a subject, and allow your hands to follow the movement of your eyes. When you trust your own drawing reflex, the art that you create will become more expressive and beautiful than what you've done before. Not great with a pencil? Don't worry, everyone can learn to draw this way and you don't need any special talent or class. For any level of artist, from a beginner with little talent to an illustration expert, The Zen Drawing Pack is not about making perfect pictures, it is about the experience of drawing, finding inspiration, and connecting to the world around you. The Zen Drawing Pack contains 2 books; one an 80 page book titled The Miracle of Zen Drawing, and a 128 page guided journal to draw in using the meditative drawing technique; along with 2 pencils.